As the seasons change, so does my hair styling routine. In the summer I love wearing my hair wavy and letting it air dry (with the right products of course!). Now that it's cold outside, I need to use heat styling to straighten and give my hair volume. My newest brush helping me with this task is the Olivia Garden ProThermal Anti-Static T-63. This is one of the larger brushes in the collection with a 3 1/2" diameter. It's perfect for those with long hair! I love all my Olivia Garden brushes, but what makes this one different? The ProThermal Anti-Static collection works to maintain and distribute heat evenly while minimizing static. There's nothing worse than static ruining a beautiful blow out, right? 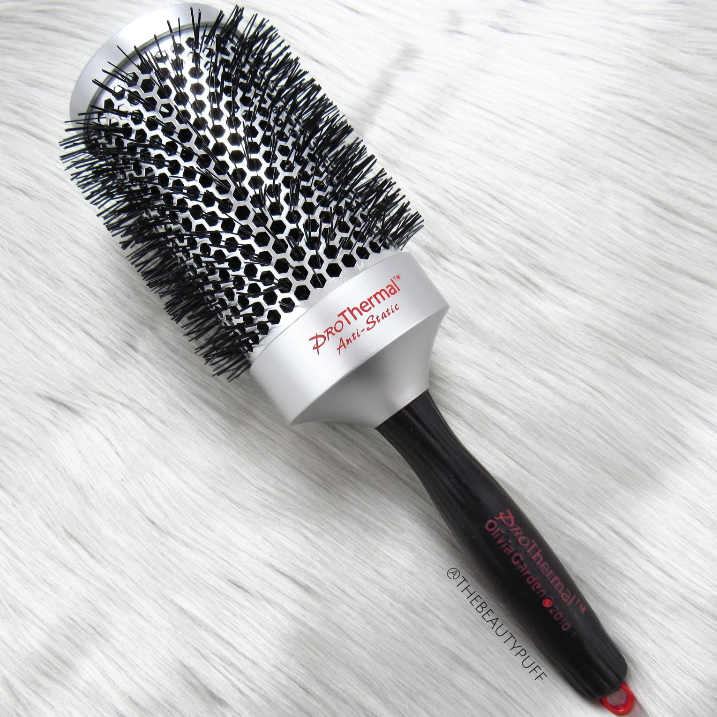 This brush really helps tame those flyaways and keep hair silky smooth. With the ProThermal collection, it's all about details. The special cap design allows more air to flow for more efficient styling. The actual holes surrounding the bristles are also larger to speed up drying time. As with other Olivia Garden brushes, the barrel conducts heat to lock in your style and maintain even temperature. You might think, with the brush being so big, it might be heavy. But that's one thing I love about Olivia Garden brushes, they're light-weight and so comfortable to use. The handle gives a secure grip and the weight is balanced so heat styling is effortless. As a bonus, many Olivia Garden brushes also have a sectioning pick within the handle. You simply remove it, flip it around and put it back in the handle for ease of use while styling. It really helps with my layered style!